For the city in New York, see Saratoga Springs, New York. Saratoga Springs is a city in Utah County, Utah, United States. The elevation is 4,505 feet. 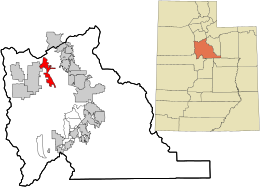 It is part of the Provo– Orem, Utah Metropolitan Statistical Area. The city is a relatively new development along the northwestern shores of Utah Lake. It was incorporated on December 31, 1997 and has been growing rapidly since then. The population was 1,003 at the 2000 United States Census, while the 2009 estimates placed it at 16,125,  making it one of the fastest-growing U.S. cities during this time period. The 2010 United States Census states population at 17,781,  meeting expectations of growth despite the state of the economy. Saratoga Springs became a city in 2001. According to the United States Census Bureau, the city has a total area of 16.61 square miles (26.8 km²), of which 16.51 square miles (26.4 km²) is land and 0.1 square mile (0.3 km²) (1.26%) is water. The natural hot springs near the source of the Jordan River inspired early European-American settlers to create a resort known as Beck's Saratoga Springs, named after the original New York resort and owner John Beck. The Beck family opened their resort in 1884 and used it as their residence. With several lodge buildings and amusement park facilities, the resort became a popular location for tourists and visitors. The original buildings were taken down. The resort area has now been redeveloped privately, containing an outdoor pool, clubhouse, bowery[ definition needed], and kitchen facility for groups and parties. Saratoga Springs has a manager-by-ordinance form of government. A professional manager is appointed by the City Council to oversee the daily operations of the city. As of 2014, the mayor of Saratoga Springs is Jim Miller. Former mayor Mia Love (January 2010 - January 2014) in 2015 was elected to the United States House of Representatives from Utah's 4th congressional district; she is the first black female Mormon Republican elected to Congress from the state and the first of Haitian descent; her parents migrated to New York in 1973. 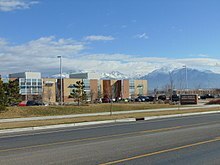 Saratoga Springs is part of the Alpine School District, which covers all of Utah County north of Orem. Due to rapid population growth, Saratoga Springs had to build several elementary schools, followed by its junior high and high schools. In addition, a private girls' school, the New Haven School, opened in 2014. As of the 2010 census Saratoga Springs had a population of 17,781 in 4,387 households and 4,022 families. The racial and ethnic makeup of the population was 89.4% non-Hispanic white, 0.5% African-American, 0.9% Asian, 0.8% Pacific Islander, 0.2% non-Hispanics from some other race, 0.3% Native American, 2.8% from two or more races, and 5.8% Hispanic or Latino. The median age in 2010 was 21.6. As of the census  of 2000, there were 1,003 people, 271 households, and 249 families residing in the town. The population density was 98.2 people per square mile (37.9/km²). There were 301 housing units at an average density of 29.5 per square mile (11.4/km²). The racial makeup of the town was 94.72% White, 0.60% black, 0.10% Native American, 1.00% Asian, 0.50% Pacific Islander, 0.90% from other races, and 2.19% from two or more races. Hispanic or Latino of any race were 3.99% of the population. There were 271 households out of which 57.6% had children under the age of 18 living with them, 84.1% were married couples living together, 4.4% had a female householder with no husband present, and 8.1% were non-families. 6.3% of all households were made up of individuals and 1.8% had someone living alone who was 65 years of age or older. The average household size was 3.70 and the average family size was 3.88. In the town the population was spread out with 38.3% under the age of 18, 10.2% from 18 to 24, 32.9% from 25 to 44, 14.9% from 45 to 64, and 3.8% who were 65 years of age or older. The median age was 26 years. For every 100 females, there were 101.4 males. For every 100 females age 18 and over, there were 99.7 males. The median income for a household in the town was $62,212, and the median income for a family was $61,923. Males had a median income of $44,464 versus $36,739 for females. The per capita income for the town was $20,304. About 3.8% of families and 2.5% of the population were below the poverty line, including 2.7% of those under age 18 and 17.4% of those age 65 or over. ^ Fastest Growing U.S. cities from 2000 to 2009, www.biggestuscities.com. ^ 2010 Census Redistricting Data (Public Law (P.L.) 94-171) Summary File—Saratoga Springs city/prepared by the U.S. Census Bureau, 2011. 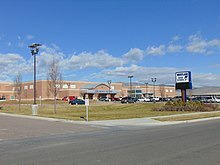 Wikimedia Commons has media related to Saratoga Springs, Utah.